The main goal in Bacterial Takeover is to destroy as many planets as possible. Attacking a planet uses up all Bacteria and Nanobots, and resets colonies and Bacteria upgrades. Destroying planets unlocks new upgrades and features, such as Colony irradiation or Nanobot production. After entering a Black Hole, the player enters an alternate timeline where none of the planets have been destroyed. The planets in the alternate timeline have the same stats and defenses, but can unlock different features. For example, destroying the fifth planet after the first Black Hole unlocks Bacteria irradiation. 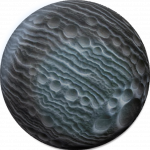 The first 34 planets have unique descriptions and artwork, but the others are generated automatically. The player can attack every planet an unlimited number of times until it is finally destroyed. A planet counts as destroyed if its remaining population has been reduced to 0. However, it's not possible to attack a planet if the player cannot destroy enough population to gain even 1 Gene Strand. The amount of population that is destroyed during the attack is equal to the total of the population destroyed by Bacteria and Nanobots. The formula that determines the percentage of population that will be destroyed by Bacteria is based on the SIR model for the spread of infectious diseases. For this reason, it can sometimes take more Bacteria to kill the last 1% of the population that it was required to destroy the first 99%. Killing a percentage of a planet's population earns Gene Strands. If the player has already unlocked Minerals, completely destroying a planet also has a chance to drop a Mineral native to the current planet. Destroying planets also unlocks new game mechanics and upgrades. Both attacking and destroying planets resets certain resources, upgrades, and bonuses. Each planet has a larger population than the previous one. Population can reach large numbers in early game, which are displayed using abbreviations or scientific notification, if it has been enabled in the settings menu. The higher the population, the more Gene Strands can be earned from completely destroying the planet. Even though planet population is not technically a form of defense, planets with higher population are harder to destroy, because they require additional Bacteria to infect. It's possible to view the population of previous planets since the last Black Hole in the Destroyed Planets panel. Currently, there are two types of planet defenses: Nanobot resistance and antibacterial shields. Nanobot resistance reduces the effectiveness of Nanobots. There are 4 tiers of Nanobot resistance. Nanobot resistance coefficient is determined by Nanobot resistance and it is used to calculate the effectiveness of Nanobots when attacking the planet. Starting with Tesmielara, all planets have shields, which makes them harder to destroy. The shield level increases by 1 for each planet. So the next planet after Tesmielara will have Level 2 shields and so on. Shields multiply the amount of Bacteria needed to destroy the planet by 15x, where x is the shield level. This page was last edited on 19 July 2018, at 11:58.